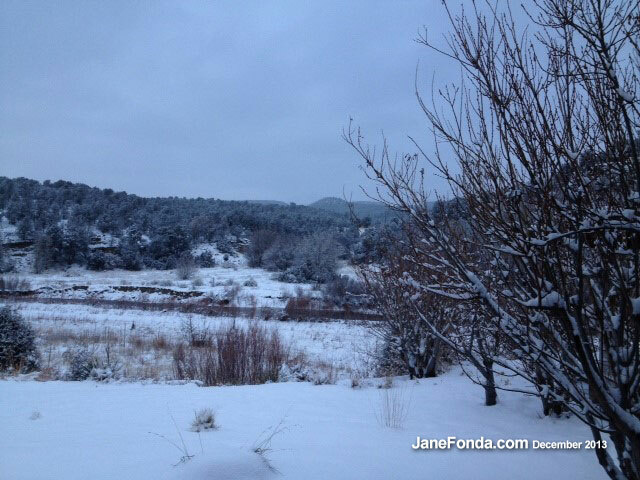 The extended family gathered outside Santa Fe over Christmas and we were treated to a few glorious snow storms which blanketed everything and gave my grandson, Malcolm, several chances to go skiing in very good conditions. The Santa Fe ski basin is about 40 minutes from the ranch. The kids had snow ball fights and Troy pulled Malcolm on a sled behind a 4-wheeler up some of our hills. (In some parts of the country 4-wheelers are called Quads. Just learned that). I went 2 days early to put up the Christmas tree which is 14 feet tall. 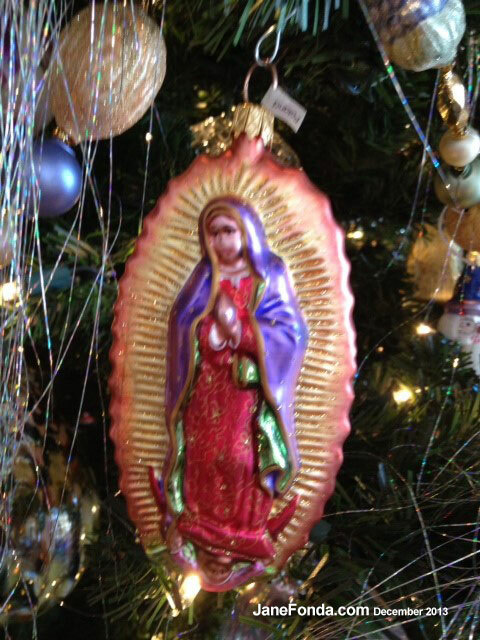 The tree is always a central focus of Christmas for me. Probably this is because my father always put a great deal of time and attention into the tree we had, whipping Lux soap flakes in water (Had to be the exact right ratio of flakes to water) till it because a thick foam that he would spread on each branch. It looked like snow. 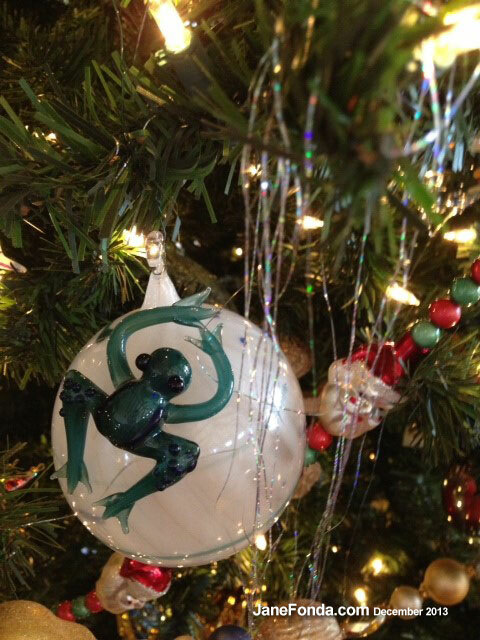 Like him, doing the tree has become my own little –or not so little–work of art. 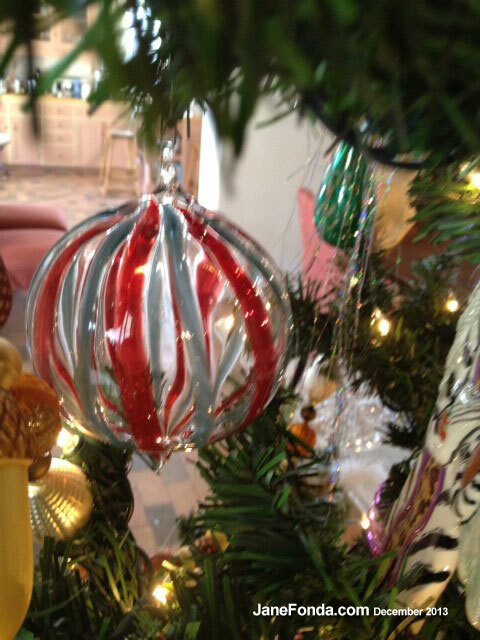 I have collected decorations over many decades and they are like old friends that I unwrap each winter and greet anew. Here are some that I made while I was filming “Barefoot in the Park”–just to give you an idea how far back this goes. I make them from paper mach over styrofoam shapes. 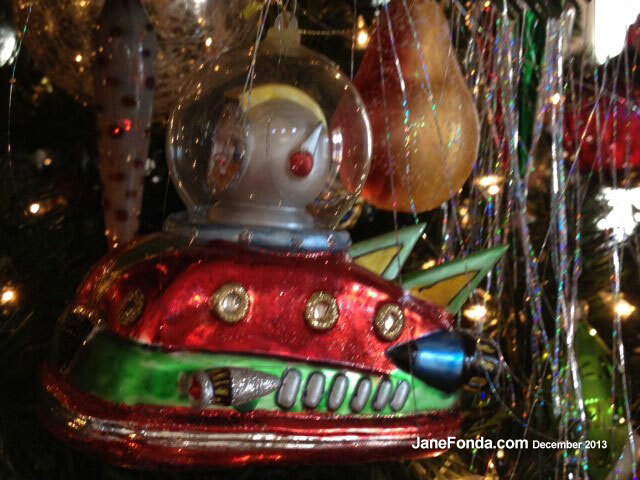 And here are some of my favorite decorations that I’ve collected over the years. I’ve never featured them individually before. Troy took pictures too. He loved the tree as much as I did. 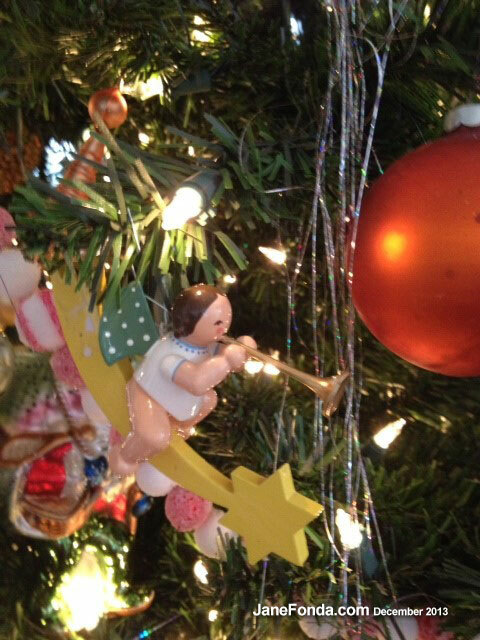 The wooden angels are made in Germany and I’ve had them since childhood. Someone made this for me when the Jane Fonda Workout first started. 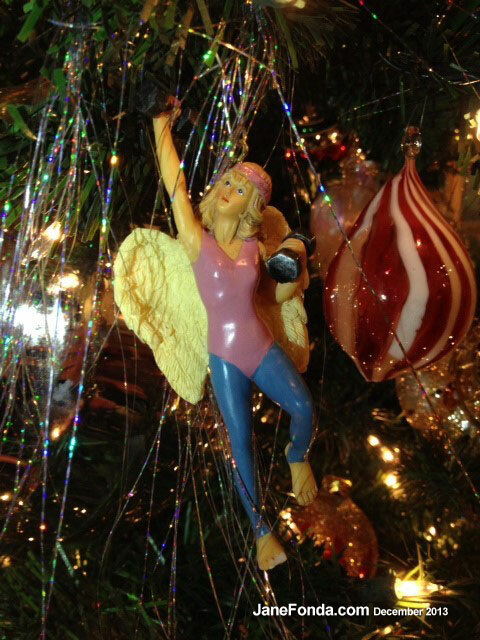 That’s me as an angel lifting dumbbells! Cute, huh? One key trick to doing a good tree in my opinion, is to create depth by putting some balls deep inside the tree, not just all on the outer branches. We played a lot of games including, here, Malcolm taking his turn at Taboo with Paul Vanwinkle, his stepdad, monitoring him. A great game and his team won. We also played Balderdash, Scattagories and an enlightened game of Hide The Object. 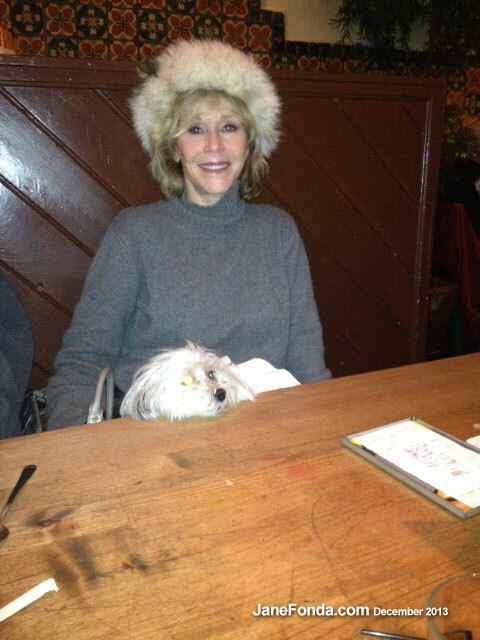 We went out to dinner one night to the wonderful Pasquale’s on Don Gaspar. Tulea liked it too. 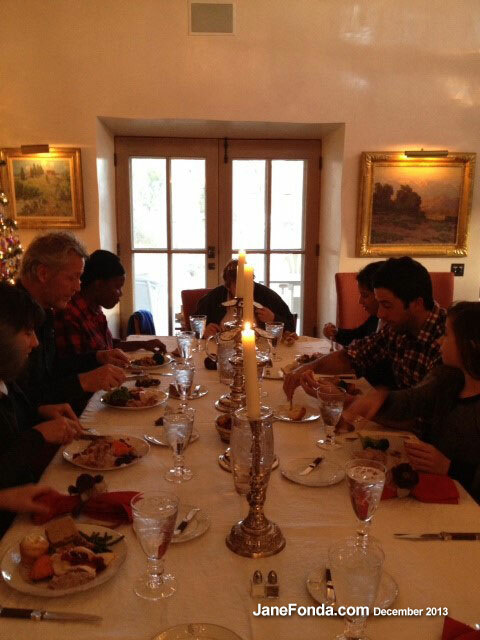 Here we are at Christmas dinner which was scrumptious, cooked by chef Roland from Joe’s Dining in Santa Fe. 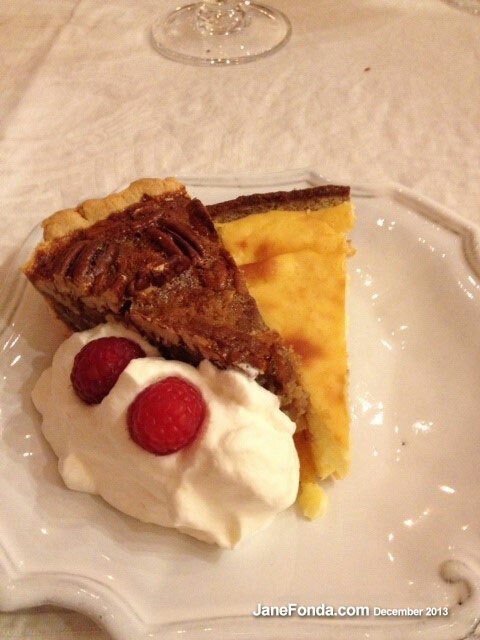 And for dessert, pecan pie and lemon creme brule. Yummy. 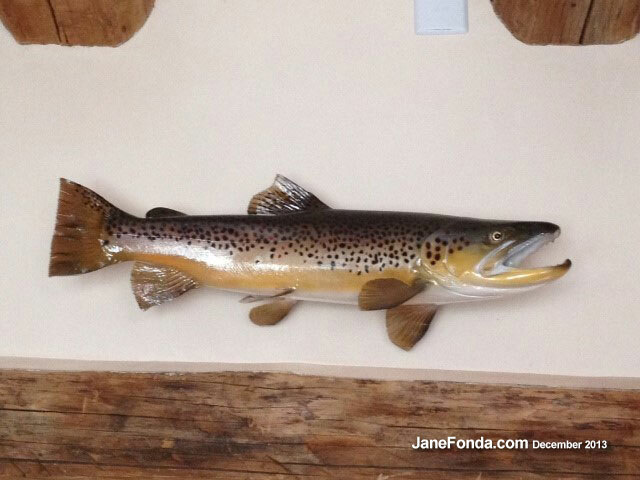 And just for show off, here’s a brown trout I caught and mounted. I hope all the friends I have on social media had a lovely, happy holiday and I send you all wishes for a prosperous, healthy more peaceful New Year. I also hope the year goes more slowly. I mean really, last year (or what is almost last year–not quite–) seemed about two weeks long. 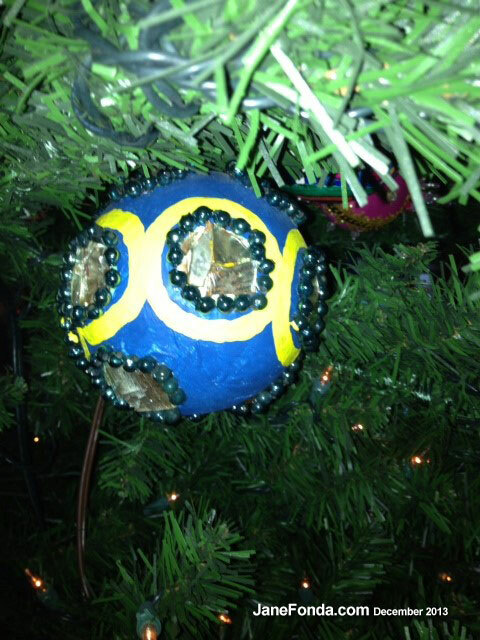 Love the ornaments and your tree. Did you know Barbarella is on tonight? Ooh la la…it’s still HOT, so thank you! Fantastic Tree. It was Prince Albert, Queen Victorias husband who gave us the xmas tree. 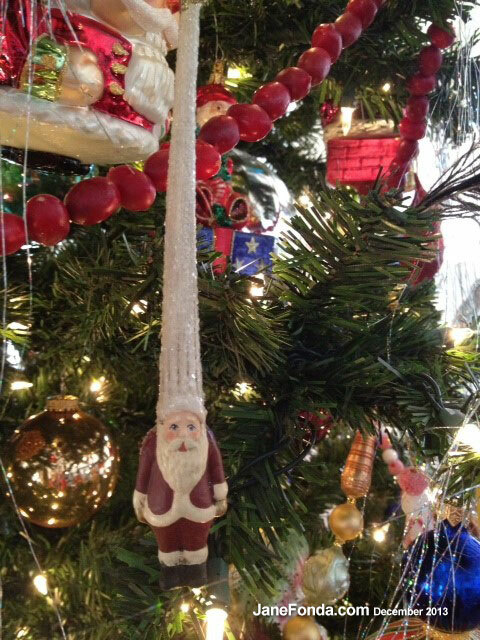 The Victorians used to light small candles all over the tree, this caused thousands of house fires. Love the Brown trout, i fish for Salmon on the river Tyne Northumberland england. I think you would enjoy it up here, check it out on the web some time. Do you watch Downton Abbey, and if you were offered a role would you accept. Shirley Mclain has made an apperance in the xmas special. Sure I’d accept a role in “Downton Abby” if offered. It’s a great show. 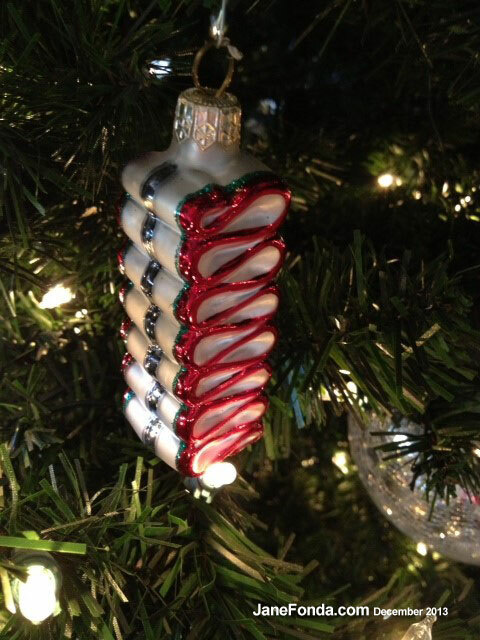 Christmas ornaments can be like a quilt. Each one tells a story, triggers a memory. 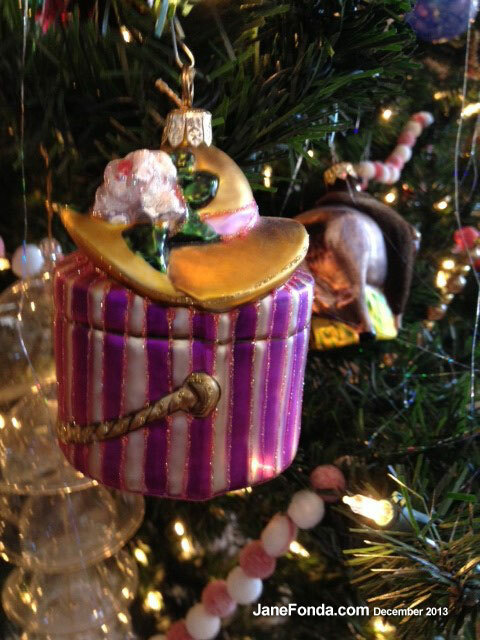 We treasure our ornaments at my house, ones from my great grandmother all the way through the ones we still buy during our travels today. Beautiful tree, Jane, and a beautiful family. 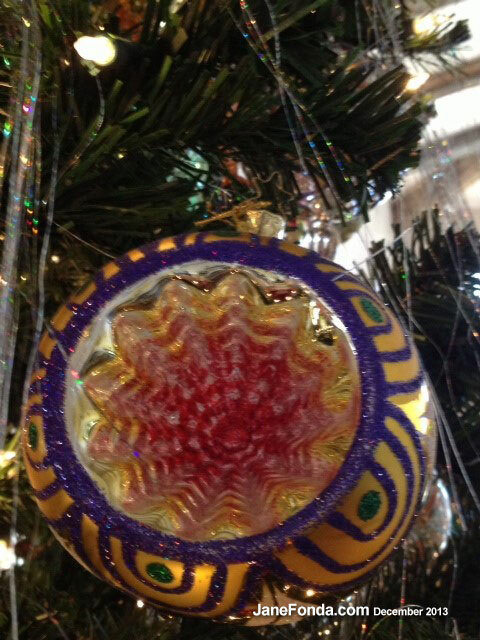 Have a wonderful 2014. Happy Belated Birthday! (I’m really embarrassed), Merry Christmas, and Happy New Year, Dear, Lovely Jane! So happy to be on the same planet with you! So proud to have spent many days with you, and owe you so many great moments, that would not be as great without you. From so faraway, you have always touched my life, and made it better. Wish you as many blessings and joys, as you have given to so many people, and to this world. 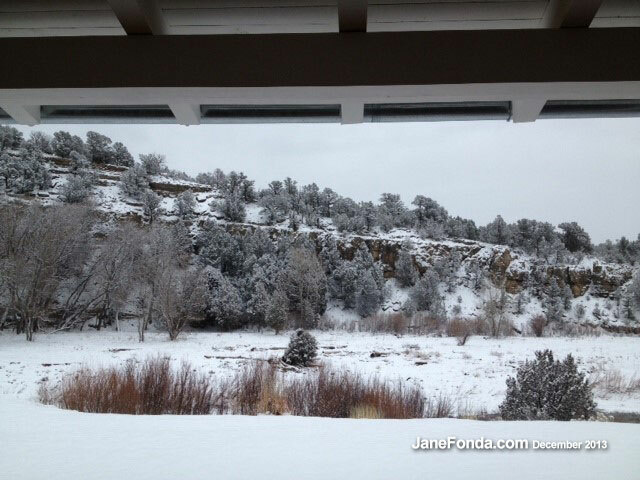 Merry, happy Christmas and New Year to you — and your family — Jane. Your tree is really, really lovely. 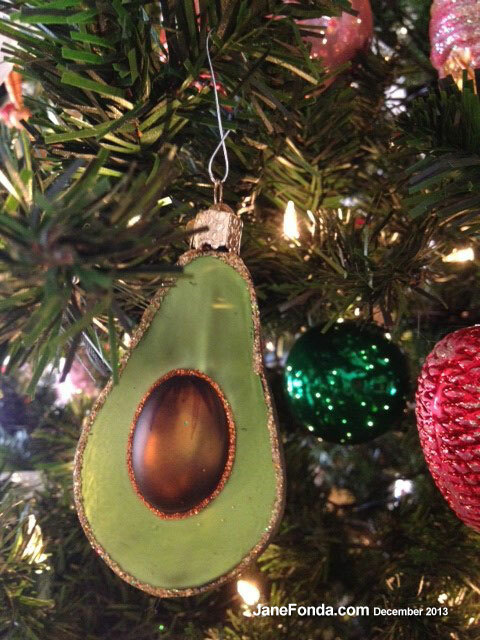 My favorite ornament is the halved avocado. 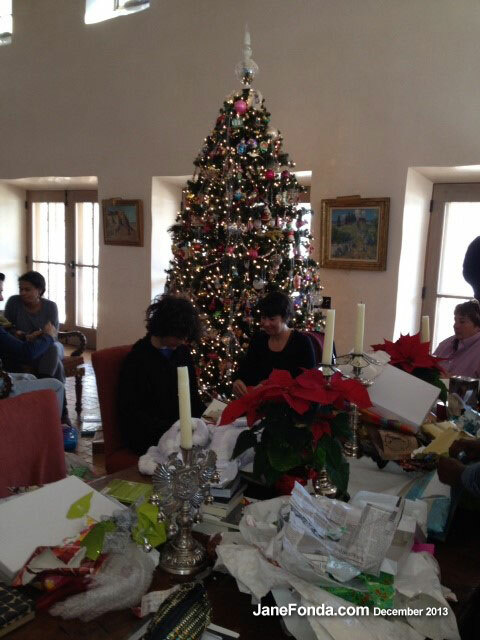 The holidays I shared with my family were great. 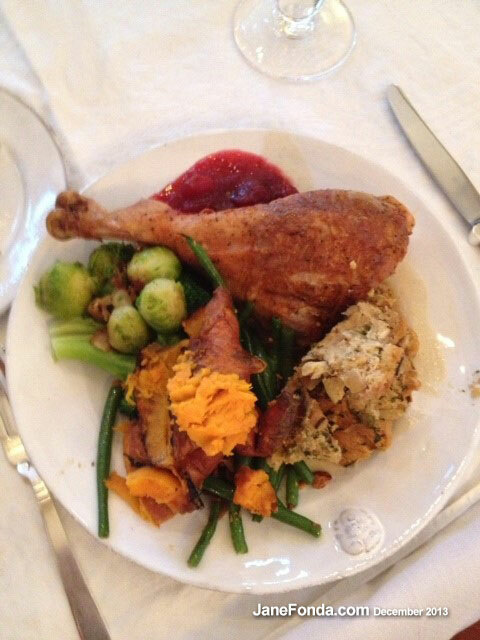 Lots of calm, warmth, love, generosity — and delicious food. (I was just thrilled to have two days off from work.) 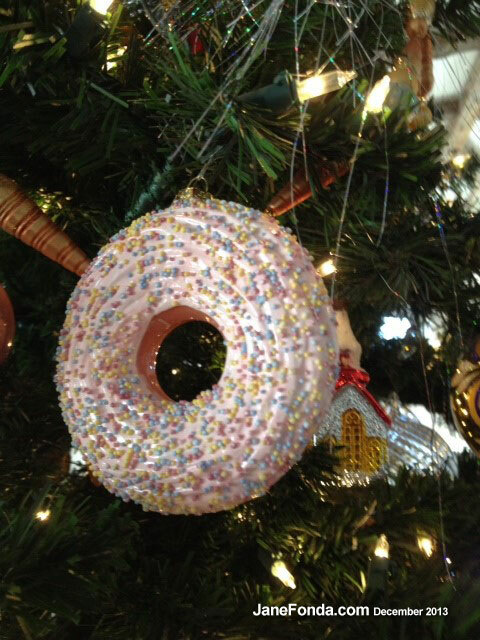 I look forward to one day beginning to decorate our own tree. We used to have seven cats, now (with four deceased over the years) we have three — so a tree, in a small home, can be a challenge. (Wouldn’t trade the love of our cats for the world though.) 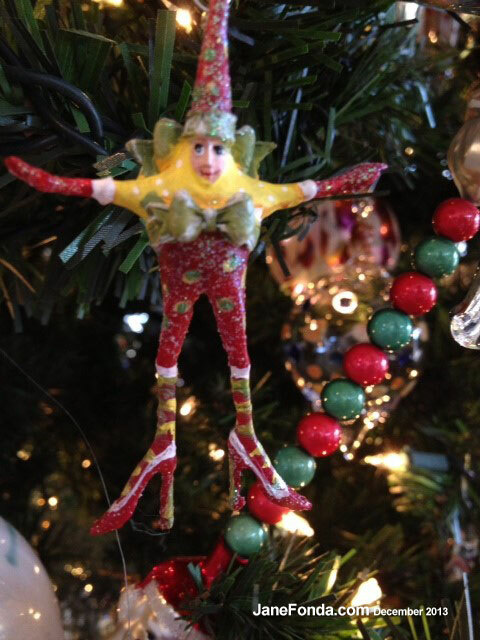 My Mom threw away all of the ornaments and hand-knit Christmas stockings that my sister and I grew up with, during a period of necessary catharsis after her and my Dad’s divorce (they are both happily remarried now). 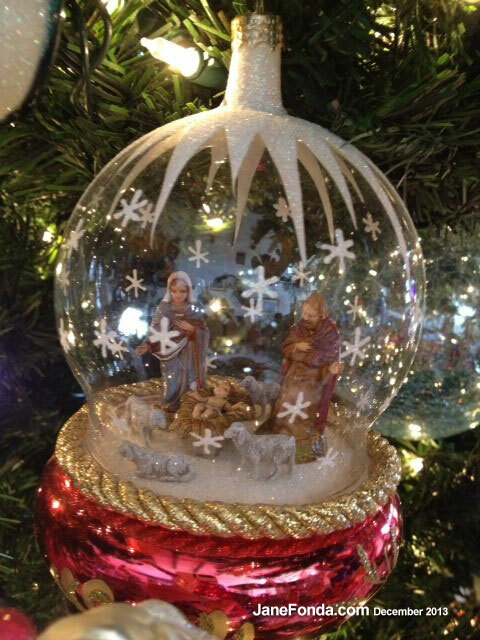 This was shocking and sad news to me when I learned of her disregard for other people’s attachment to those memories — but, then, I decided to understand the pain she must have been experiencing & I realized that the memories (especially of sitting behind our family Christmas trees, staring at the lights — it felt like I was “inside” Christmas, when I was much smaller) will never fade. Anyway, thank you for sharing your memories in the making with us. Happy Holidays, friend. 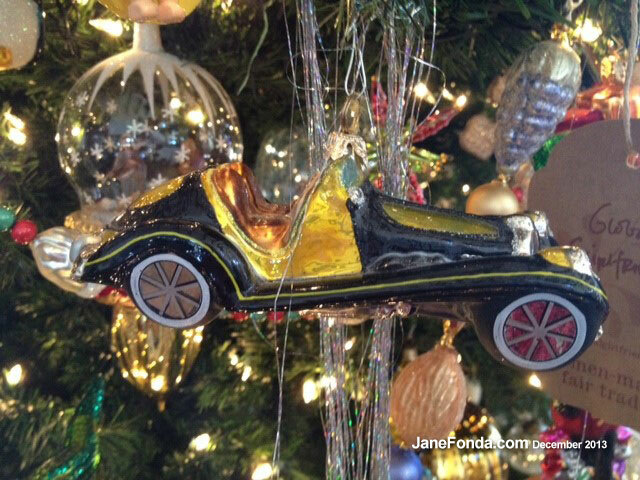 Jane, I love your tree and the ornaments, particularly the more whimsical ones. 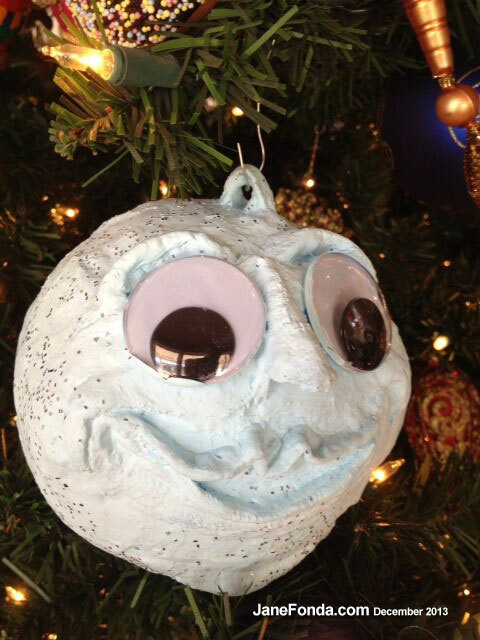 Do you actually decorate the tree yourself? I was just wondering when does Simone ever get to see HER family for holidays. Seems like she always with you at holiday time and her family gets short shrift. The dat after Christmas, Simone and Troy went to Chicago to be with her family. She sees them a lot and they are wonderful. 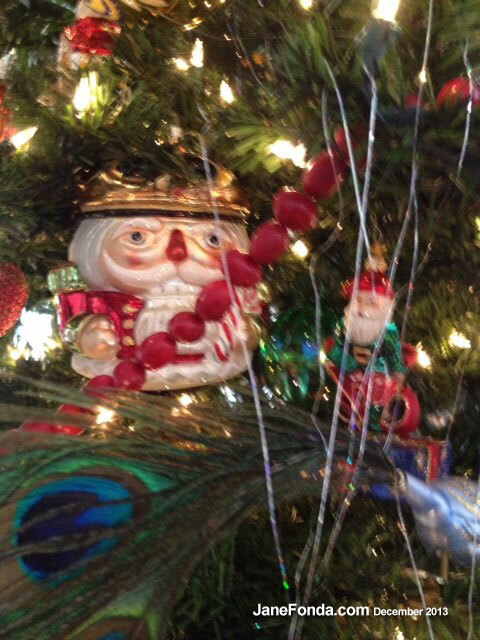 At first, I thought that tree had to have been air-brushed-:) But, good lord- you handcrafted many of the ornaments yourself. Just magnificent. 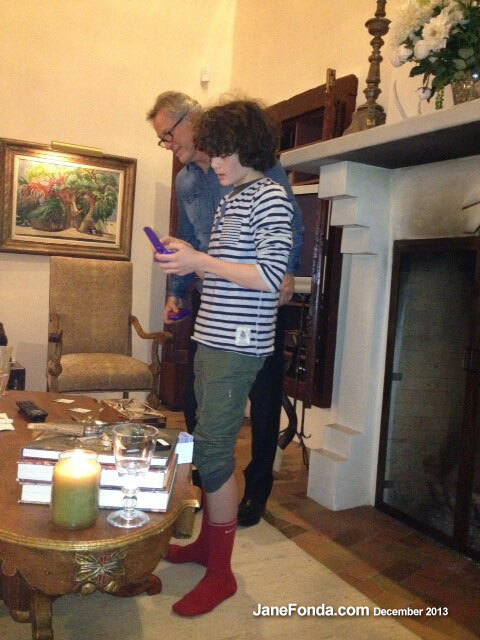 And I love Malcolm’s Red Sox. So cute! Happy 2014! 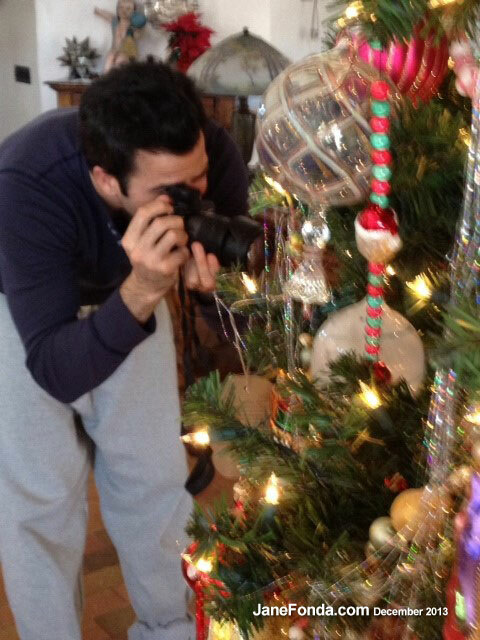 I really enjoyed looking at the pictures of your tree and ornaments. Magnificent! I just wanted to wish you Happy New Year to you and yours! 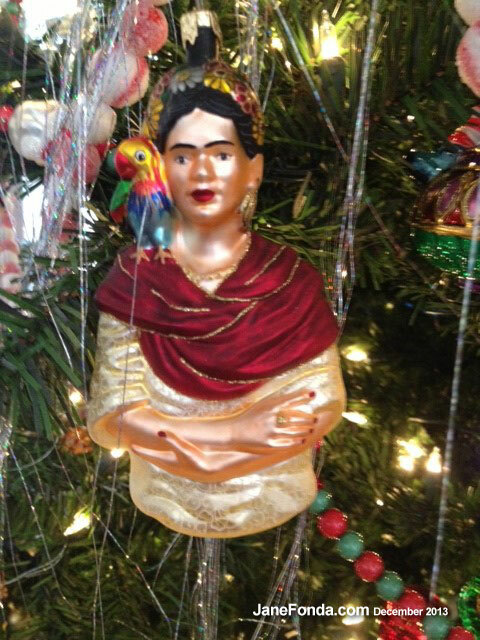 Splendid your Christmas tree ! 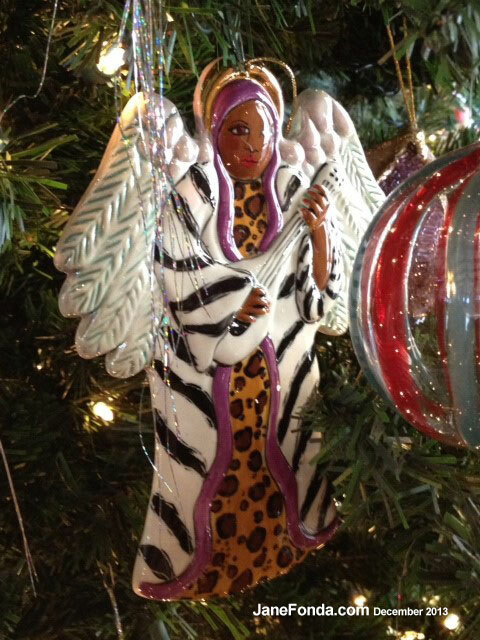 the wooden angels are adorable. 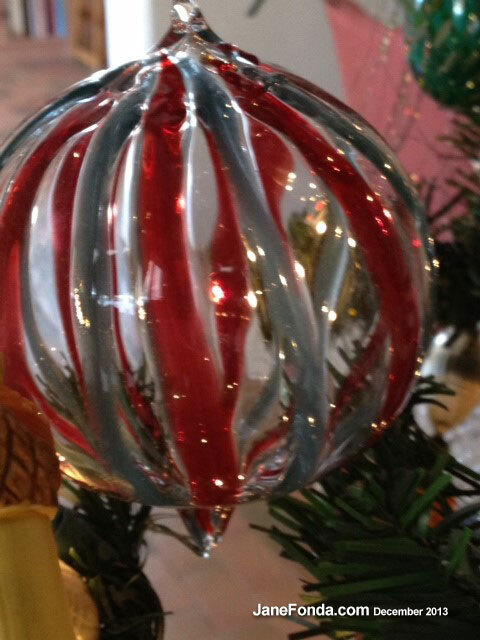 Your glass decorations are also beautiful. Happy birthday late, and very Happy New Year for you and your family. 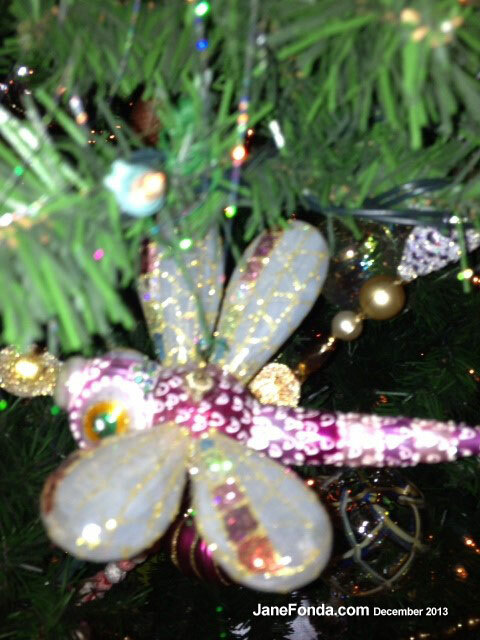 Love your tree and the fact that you have kept so many decorations and how much they mean to you…. 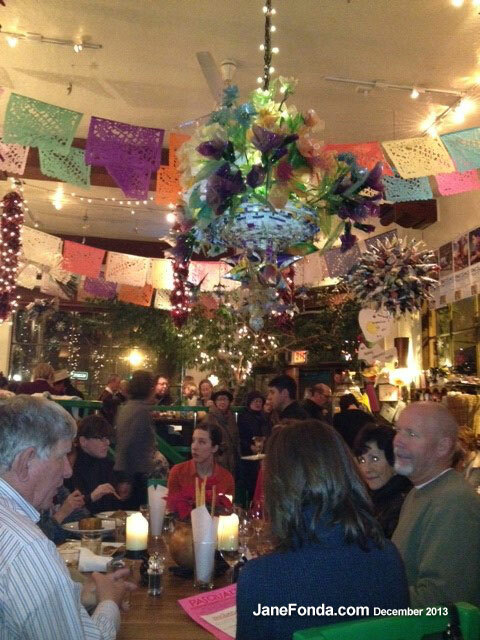 The pictures are outstanding and I enjoying knowing the places that you go to eat in the Santa Fe area. I cannot thank you enough for that line in your blog… at 77 I forget more these days but you have enabled me to remember one of the best Christmas times when mother made snow. I will now share this with my children and grandchildren. 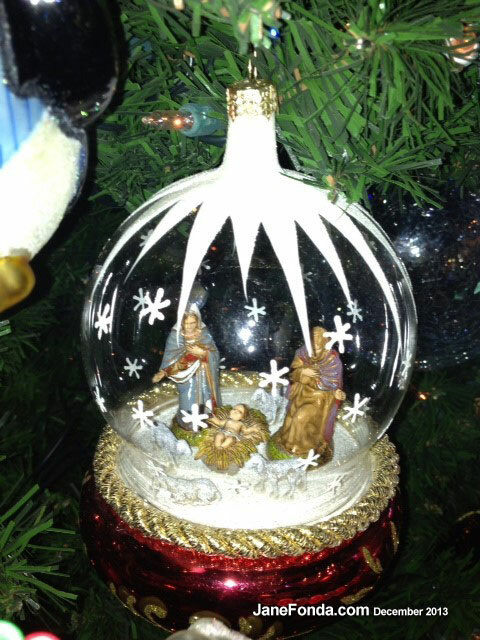 Jane, thank you so much for sharing with us your special Christmas pictures. 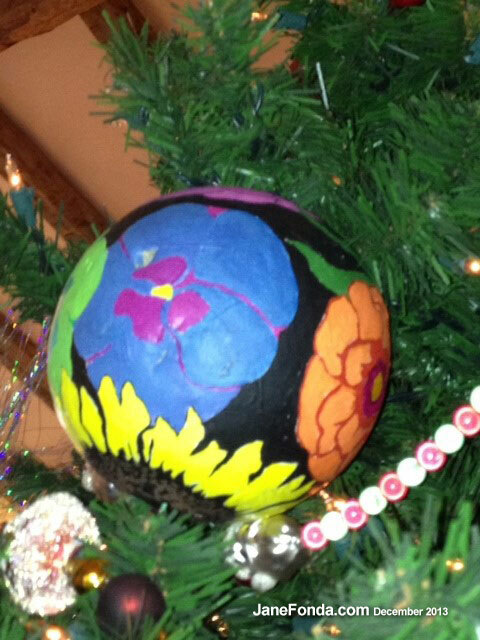 When I first saw the picture of your tree I thought it was the most perfect and beautiful tree I have seen this year. As I scrolled down and read your comments as you shared decorations that you not only made, but ones that have been with you for a long time, my heart just warmed up because I did the same thing this year with mine. 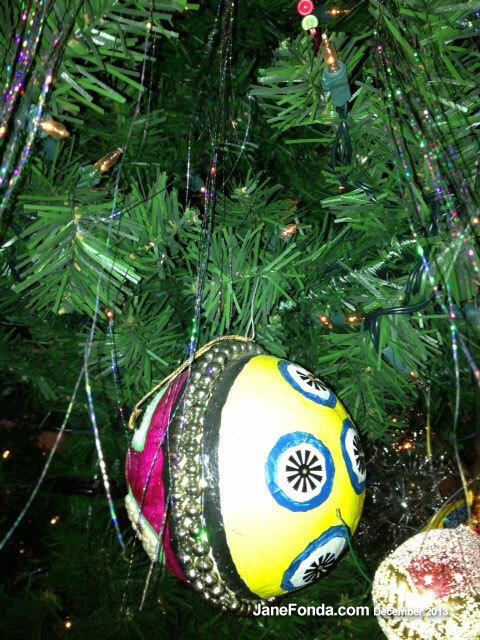 One of my most favorite parts of Christmas are pulling my ornaments out and putting them carefully on the tree. 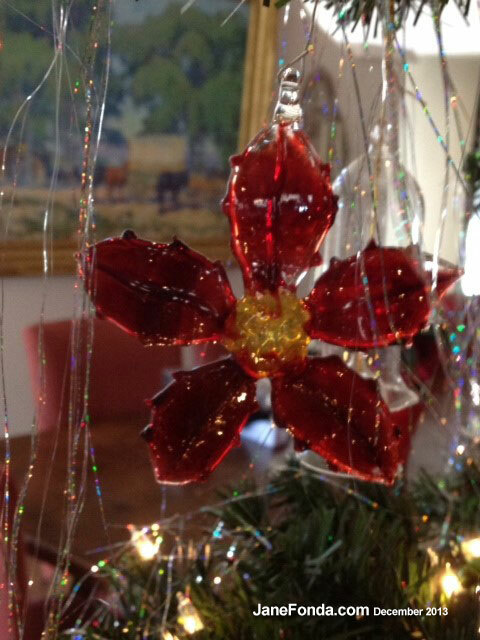 The “1st Christmas” for each of my 3 children, the ones that the kids made me, the ones that even hung on my mom and my grandma’s tree are added to remember them. I had a much smaller tree this year but it was the perfect size for my daughter and I. Yesterday I noticed it was very dry and ready to go and after taking the decorations off I could pick it up with one hand and walk it to the front of my apartment complex. So much easier than previous years (smile). 2014 is going to be a much better year for me as I have new goals to improve myself and the life for me and my daughter and I am excited about this year. I too hope that it goes much slower than last year and you hit it right on the head with it feeling like it was about “2 weeks” long. 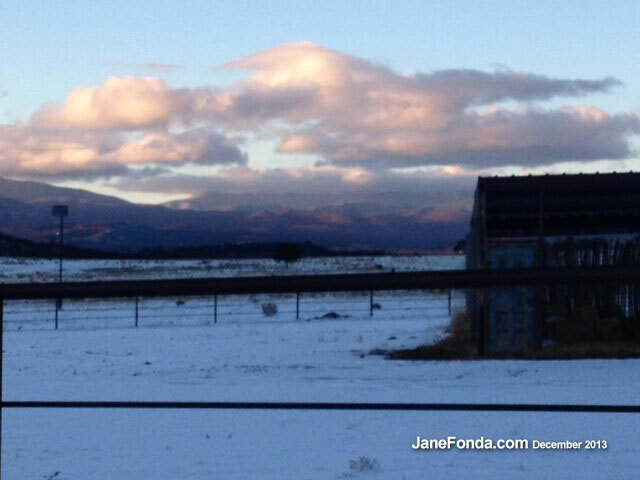 Love you Jane and I wish you the best of health and happiness for you and your family this coming year. 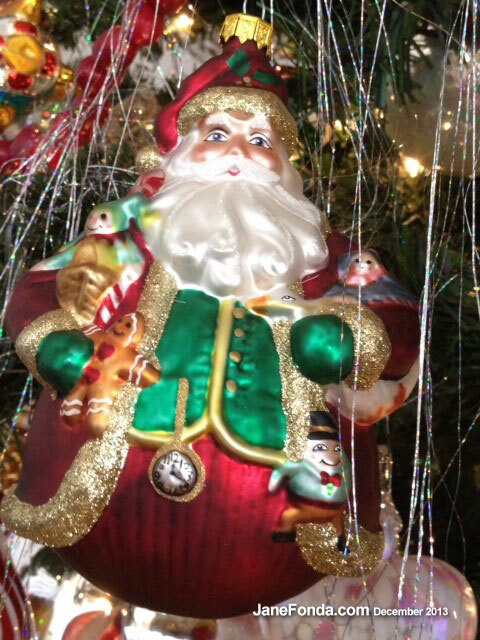 Thanks for the great Christmas blog and all the nice pictures. 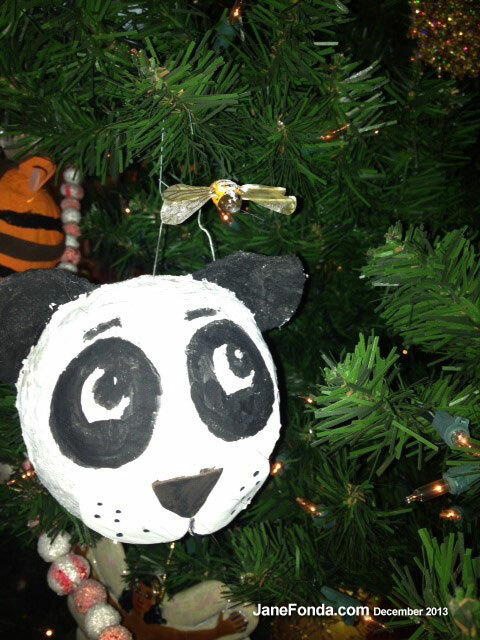 Your Christmas tree is very beautiful as are the interesting ornaments and decorations. 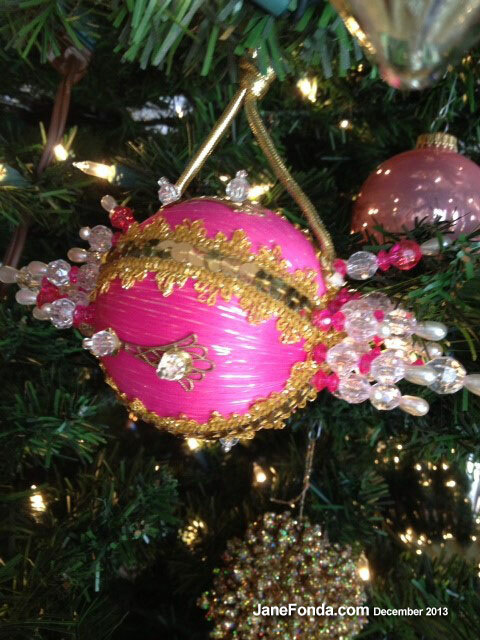 The ones you made during filming Barefoot in the Park are very pretty and creative. I wish you a happy belated birthday and Happy New Year to you and your family. I saw that my comment on the previous post was not accepted and my account was suspended (I wasn’t able to comment until now). I don’t know why. 🙁 🙁 🙁 I’m sad. Anyway, it was a Happy Birthday and Merry Christmas wish, which I hope you had. 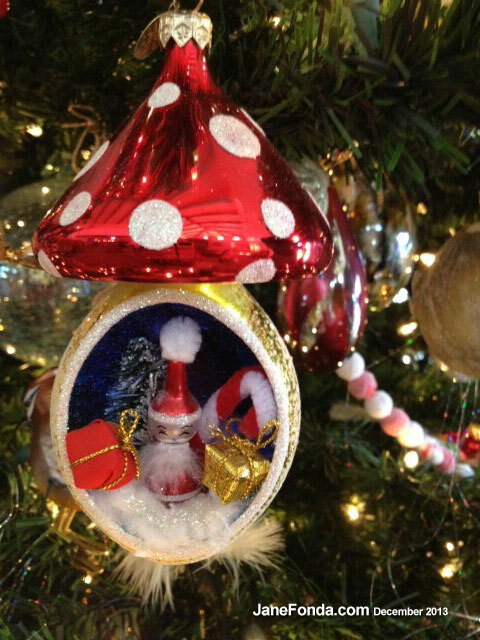 🙂 These decorations are very important, if they are personal and one doesn’t think of it as decoration only. It is special and part of a ritual. 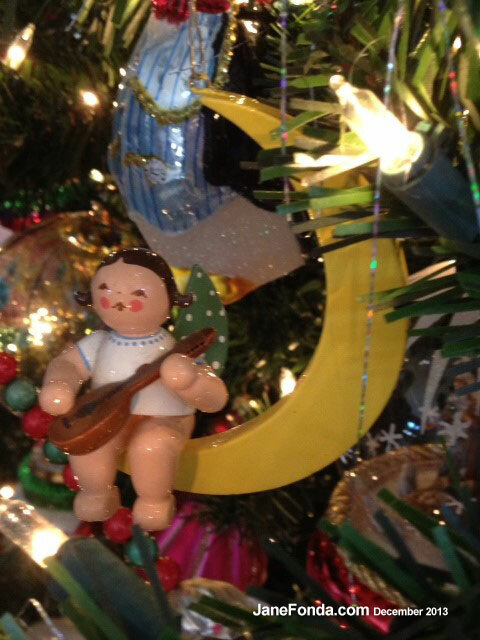 For me, every decoration has its own story (some of it is from the 1930s, some from the 1960s, some are two years old). I can feel the presence of the loved ones who cannot be with me and fond memories often come to my mind. Also, happy new year to you! I remember a couple of years ago, when you wished me back, I was totally over the moon. I’m still grateful whenever I hear from you. BTW, you looked amazing at the Palm Springs Film Festival. It’s great to see a Coming Home reunion with Bruce Dern. I think he will finally win the Oscar this year for Nebraska. Im just watchin Cat Ballou Classic Film. 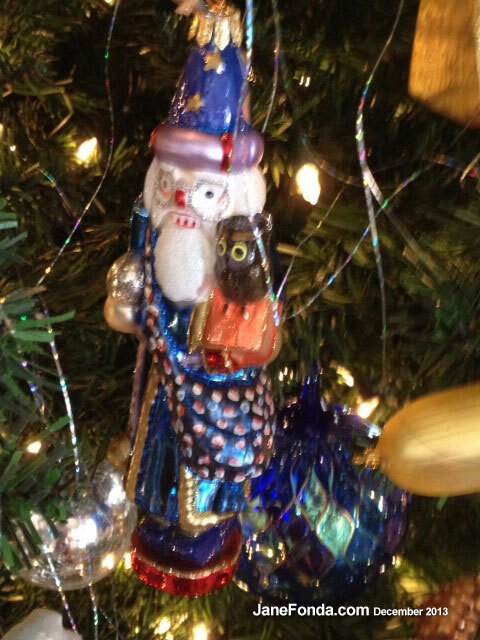 Love that tree and those awesome ornaments! Have a wonderful New Year and many new adventures in your life! 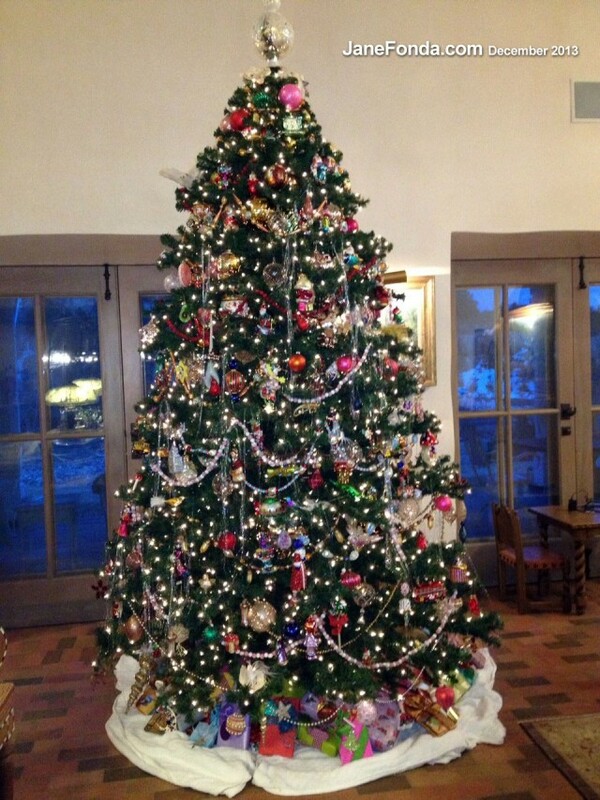 I leave tomorrow to go back to the ranch to take the tree down. Don’t ever let anyone else do it. 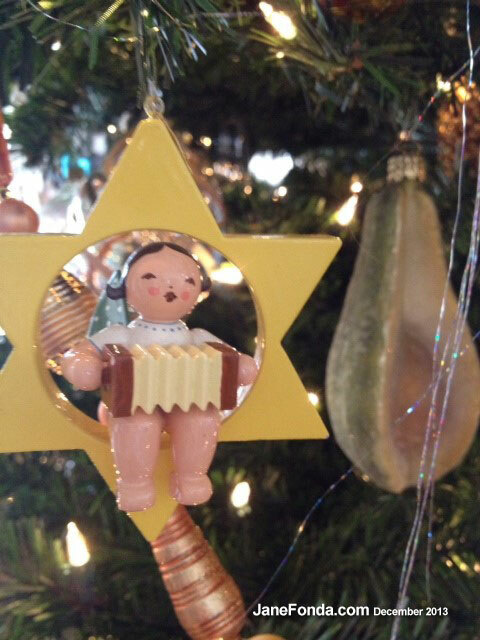 Those ornaments are my friends! Thinking about Downton Abby and the roles you’ve played, I do not recall you playing a villain. Would you have a preference on a potential Downton Abby role being above stairs or below? I think it might be fun to play Tom Branson’s mother and visit the Abby – if it was played along the lines of (Barbara Standwick’s and Bette Milder’s ) Stella Dallas. Or, if Elizabeth McGovern does not return next season, perhaps a love interest for Hugh Bonneville. Perhaps the storyline could tie your birth name of Lady Jayne, who has a hidden “past” . 2014 is off to a solidly great start. I’m no longer counting days; but, I am no less grateful (for), protective and appreciative (of) my gift. 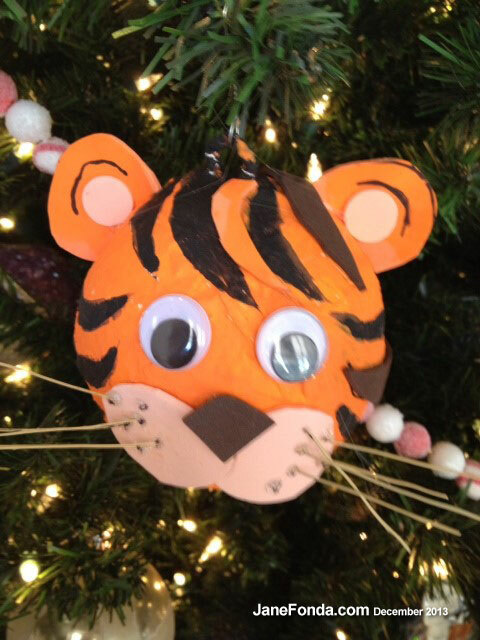 The comments about taking down Christmas trees made me laugh, while thinking about a video project I did (during my senior year in high school, twenty-one years ago). 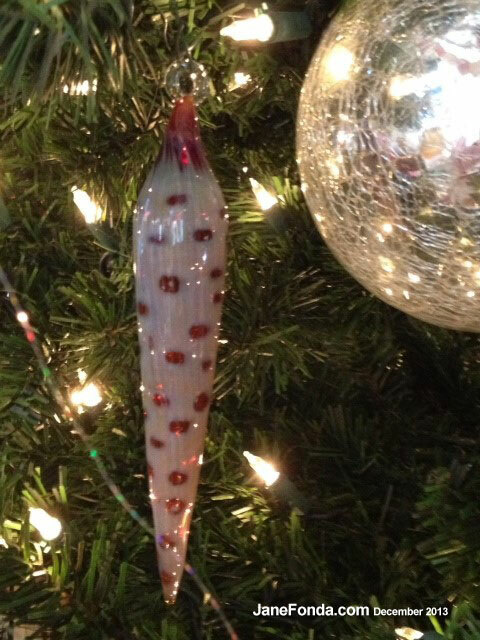 It was called “How-to: Un-decorate Your Christmas Tree.” The production of this modulated-tone Martha Stewart-eque clip was a literal scream. I was quite the dramatic, tyrannical artiste at that age. My Dad was the camera man & my Mom and I were the on-screen talent. (“No, no NOOO!! Your doing everything wrong. I quit! !” etc. as my parents generously donated their time to help me get a decent grade.) 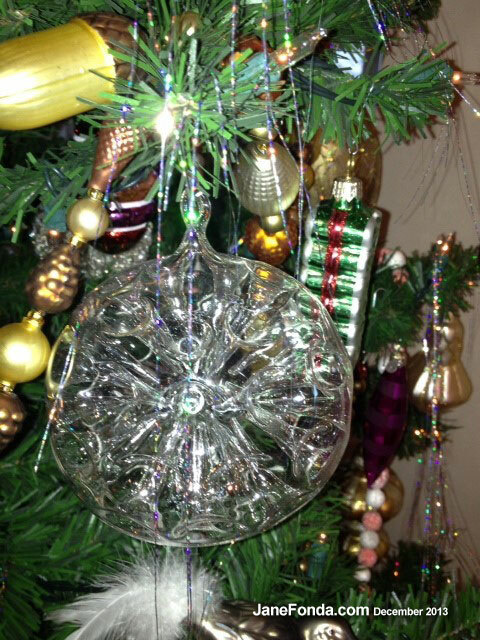 Everything was scripted by me (even the “accidental” dropping of a glass ornament to demonstrate, to the viewer, that mistakes were okay). There was music, rudimentary editing (quick cuts, reaction shots). Before the age of youtube. Always sending you my best. (Just received an increase in hours at work & a regular freelance writing gig for a local publication — no money, but experience/exposure is priceless.) Be well! Will you be walking the Red Carpet at the SAG Awards? I am lucky enough to have tickets for the bleacher seats! I am, of course, extremely excited and hoping I will get a picture of you walking the carpet. Maybe I will even be lucky enough to get an autograph from you. I know the red carpet is pretty crazy for you folks, but if you can remember, smile at us fans on the bleachers! And I really hope the cast of The Butler wins the award! Fantastic movie with fantastic performances by all, including yourself! Australia? What part? That is awesome! For business, pleasure, or both? My godfather lives near Perth. Some day I would love to go there to visit him and explore the country. Anyway, make sure to take lots of pictures and please post them on your blog. Have a safe, fantastic trip!